Jamie Oliver’s Happy Days With the Naked Chef is in the same mould as his other bestsellers: recipes for simple, comforting, homely food. This time, however, he has some interesting additions from his travels to Australia, New Zealand, America and Japan. There are three new ideas in Happy Days With the Naked Chef. Jamie has included a chapter on “Comfort Food”–the kind of cooking Nigel Slater and Nigella Lawson specialise in. He has recipes for Toad in the Hole, Fish Finger Buttie and Sticky Sausage Bap with Melted Cheese and Brown Sauce. In his “Quick Fixes” chapter, he has selected dishes where saving time and minimal washing up are the key ingredients. These include a Steak Sarnie and Chicken Breast Baked in a Bag with Mushrooms, Butter, White Wine and Thyme. He has also included a “Kids Club” chapter, which is offers inspiration for parents trying to get their children excited about food. The new additions don’t dominate the book as the remaining two-thirds contain Jamie’s standard Italian-style fare: simple salads, fish, meat, vegetables, breads and pudding. Don’t miss the excellent recipe for Medallions of Beef with Morels and Marsala and Crème Fraîche Sauce. Jamie has also been travelling and you’ll find recipes with pak choy, soy sauce and ginger popping up here and there–delicious! Simple. Surprising. Spunky. Just what we look for in a summer salad. 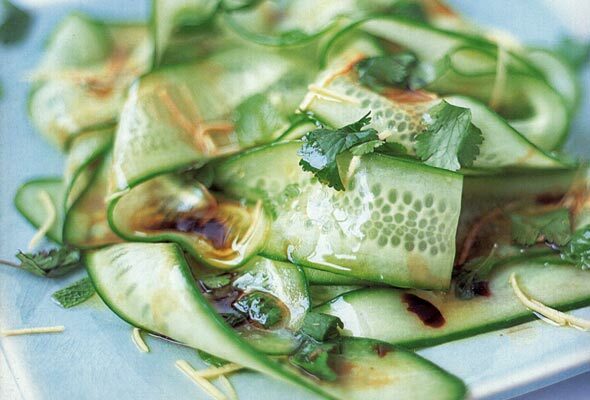 Just what we found in this jumble of cucumbers, vinegar, and ginger. We have precious few absolutes, yet we always, always keep things simple with sea scallops. Why shroud that supple sweetness? 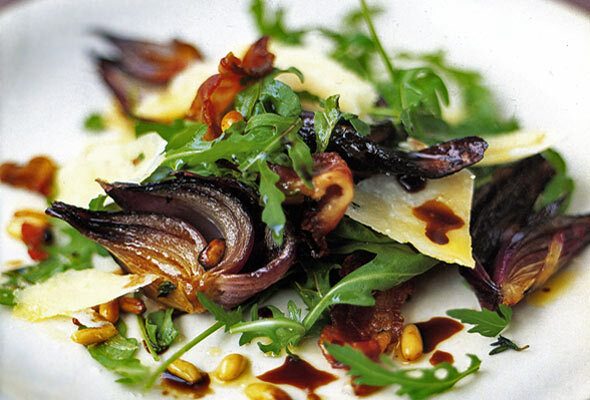 Caramelized red onions. Pancetta. Pine nuts. A dribble of balsamic vinegar. Peppery arugula. Convinced yet?